Ecuador is a lovely country with some beautiful scenery, and of course The Galapagos which lived up to all expectations. The wildlife is very photogenic, so take loads of film, and an underwater camera as there are plenty of fish, turtles, sharks, rays. 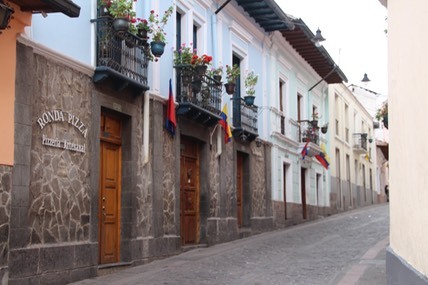 If you are staying in Quito we can recommend Cafe Cultura as a great hotel. Try to get room 2, which is large with some lovely murals. We took a trip into the Amazon jungle flying from Quito, 1 hour. 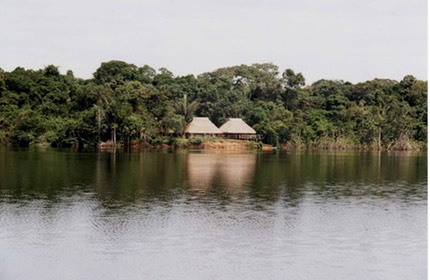 Then 2 hours on a bus, 5 hours on a high speed craft up the River Aguarico, 1 night at base camp, a 4 mile trek and then a 1 hr canoe ride took us to the camp in the photo. We swam in the lake where we caught piranha!. 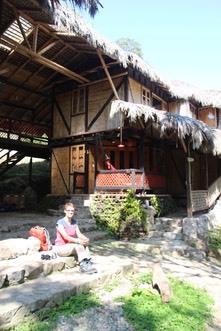 Other trips produced river dolphins and 4 different types of monkey. Took a nice photo of a highly venomous snake and then read when I got back that most tourists get bitten trying to take good photos!! One in the Southern Hemisphere, and one in the Northern Hemisphere. We had a similar picture of us at Greenwich on the meridian, but I looked too scruffy so we've got to go back and get another one. 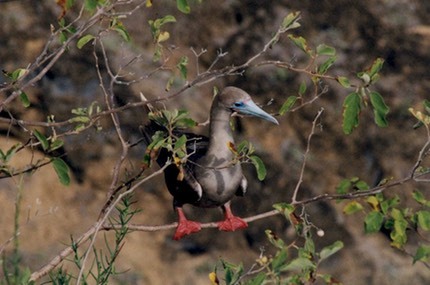 Red footed Booby. 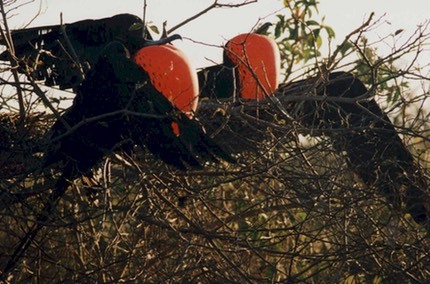 The birding was fantastic here. Even I got good photos. You will miss out on some of the species if you only do a 3 or 4 night trip - splash out on the full 7. We managed to see almost all of the endemic species and get good photographs of most. Sadly the first experience of the famous Darwin Finches you get is thousands of them squashed on the new road. 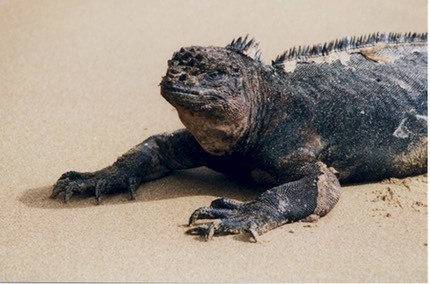 The marine Iguanas were very impressive, especially the one we saw feeding underwater. The sharks we saw were pathetic (read Viz). Two of them quaking in a cave. Jonna chased a turtle and I chased a stingray - Ay Karumba!. One of the pains of being a big lizard is that you provide a great place for the smaller insect eating lizards to perch on the look out for flies. 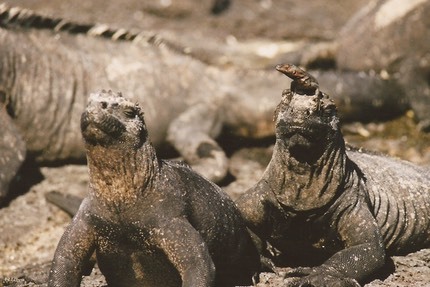 The lizard on the right has one perched on his head. 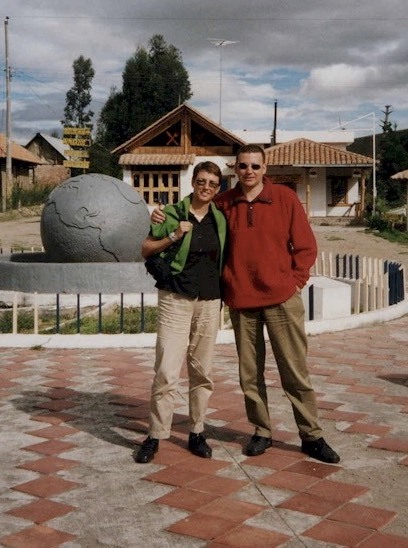 And so, back to Ecuador for the first time since 1999 when a trip to the Galapagos was the order of the day. The main aim oaths trip was to seek out Spectacled Bears (we failed) and to take a proper look at Quito. We arrived in Quito after a series of buses from Peru, and settled in for some sightseeing. 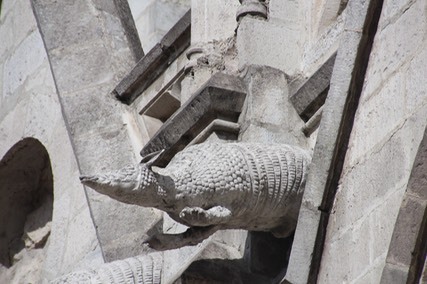 We had hoped to see an armadillo somewhere on our adventures but this was as close as we got. And so up into the hills a couple of hours away from Quito and into our EcoLodge for what turned out to be a lot of birdwatching with some snakes thrown in for good luck.We had missed the bears by a couple of weeks, as the fruiting avocado trees came to an end and the bears retreated into the higher forests. The hummingbirds around the lodge were excellent with numerous feeders enticing the birds in really close.